Crowne Plaza Gold Tower is located adjacent to Crowne Plaza Surfers Paradise. The newly refurbished Crowne Plaza Gold Tower offers premium hotel rooms and spacious self contained apartments including studio and one and two bedroom suites in a resort style setting. Every room boasts a private furnished balcony with ocean views. The Studio and Suites also offer kitchenettes and laundry facilities. 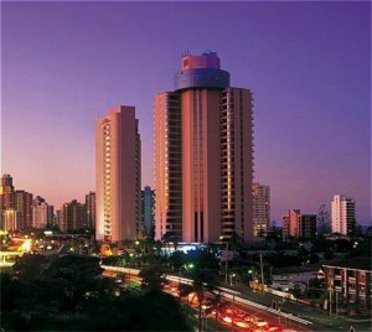 Crowne Plaza Gold Tower is located between Surfers Paradise and Broadbeach. Major shopping centres, award winning dining, nightlife and world famous Gold Coast beaches are all within walking distance of the hotel. Crowne Plaza Gold Tower shares the extensive resort facilities with Crowne Plaza Surfers Paradise including two outdoor swimming pools with heated spas and sundecks, gymnasium and sauna, full sized tennis court, games room and two restaurants and bars. The hotels Day Spa is available for massage and other relaxation treatments. The hotel features 9 flexible meeting rooms and can cater for up to 550 people. Four Winds Revolving Restaurant is Queensland's only revolving restaurant. It offers panoramic views of the Gold Coast hinterland and Pacific Ocean as well as a delicious seafood and Asian style buffet. Whether travelling for business or leisure, The Place to Meet is Crowne Plaza Gold Tower.